What is the Green School Programme? The Green School programme is an international environmental education programme, environmental management system and award scheme that promotes and acknowledges long-term, whole school action for the environment. 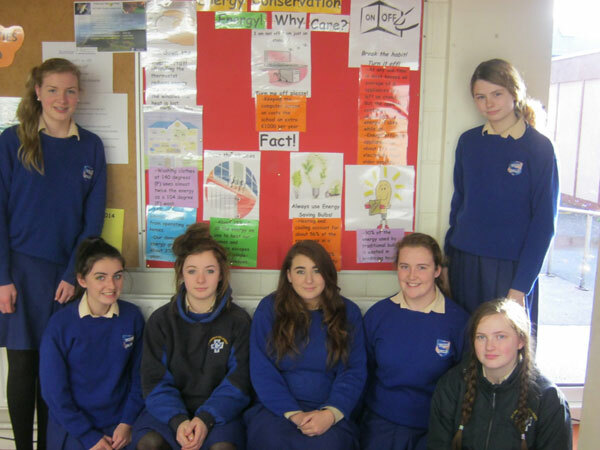 St. Brigid’s Secondary School is an active member of the Green School programme. The St. Brigid’s Green Team encourages and promotes ‘green activities’ in the school with a view to fostering an appreciation of the environment both locally and globally. The Green School committee structure in St. Brigid’s is comprised of 3 different committees and is co-ordinated by Peggy Dowling, the Green School Co-ordinator. An Action Plan was decided by the Green School Committee. This included headings such as Environmental Review, Positive Actions, Monitoring and Evaluating and Informing and Involving. The Green School Team meets every Wednesday at 9.00am and completes various tasks to ensure we promote Energy Awareness, Recycling and Water Conservation in our school. The students on the Green School Committee draft an Action Plan on each theme with particular focus on making students aware of what they can do to protect our environment not only locally but globally. To date we have received two green flags. At present our school is working towards Green Flag no. 3, Water Conservation. Whilst striving to attain the Green Flag on Water Conservation, our main aim is to focus firstly on all the ‘green’ activities that are already happening in the school. We believe that we can continue to do our day to day activities but on an environmentally friendly basis. -Bins are categorised into the following headings: All Plastics, Glass bottles, Recycling, General Waste and Compost bin. -Shared folders for both staff and students to cut down on handouts. - Fixed our photocopier to print from the staff computers double sided. In 2014 we reviewed our recycling in the school. This is closely monitored by Kevin the caretaker, Peggy Dowling the Green School Co-ordinator and the recycling committee.There is now a new reporting procedure where all classes have litter wardens and these report any litter issues to their class teacher. The class teacher in turn reports to the litter supervisor who in turn informs the litter committee and then it is acted upon. This reporting structure was introduced in November 2014 to ensure a holistic approach to green school in St. Brigid’s Secondary School. Kevin has seen a dramatic increase on the amount of litter in the recycling bins and food in the food bins. This is due to the bring in bring out policy that was introduced in September 2014, signage over the bins and also a PowerPoint presentation displayed on the TV screen in the Assembly. Also the Green School Committee and their Co-ordinator go around to classes to remind them of the importance of recycling and to make sure they are putting their litter in the correct bins. We have also displayed our recycling code in all classes to remind the students of the importance of recycling. Also all the staff endeavours to incorporate the issue of litter and waste management in their classes including CSPE, Geography, Science etc. All members of staff aim to educate the students and themselves on how to protect our environment and promote stewardship in our school community. There is also a Green School notice board informing both staff and students on important facts on Litter and Waste Management. Not only does St. Brigid’s participate in the Green School Initiative, our Transition Year students are also part of the Tidy Towns. As part of the Gaisce Award we do litter picking in the National Park. We have also been assigned the task of planting bluebells and snowdrops on Mission Road whilst also focussing on the pollination of bees. This year we are renewing our Green Flag on Energy. The school has introduced various measures to ensure St. Brigid’s is an energy efficient school. -	Kevin our Caretaker goes around to all classrooms at the end of the day and ensures that all windows and doors are closed, Projectors, computers and computer screens, printers and photocopiers are switched off. The Green school Committee have carried out draft tests, analysed bills, put up posters around the school reminding the students to turn off the lights, close windows and doors, and turn off the computer and the computer screens. The Committee has also carried out Energy surveys and questionnaires and analysed the results and presented the findings on pie charts. They also did an Appliance Audit as part of the Environmental Review. The committee also designed a PPT on Energy which is played in the Assembly reminding the students to be more energy efficient. All the facts and figures of Energy in our school are displayed on the Green School notice board. -	We have now put in 2 500 ml bottles into the cisterns to reduce 1 litre of water per flush. St. Brigid’s have changed all the taps in the school from the old twist taps to compression taps. Twist taps use 5 or 6 litres in 30 seconds, but compression taps only use 3 litres in 30 seconds. This is because they reduce the water flow, so there is more force and less water used. We also changed the syphons in the toilets. They use 9 litres to flush if you don’t hold down the lever, but they only use 6 litres if you hold the lever down for only 5 seconds. As part of our Environmental Review we carried out flow rate tests, water usage surveys, read water meters, and carried out questionnaires and analysed the findings. We presented the findings on pie charts. We also did toilet and tap audits. We also contacted the Local Council to see where our water meter is and read it. We will take this reading and compare to next year’s reading to see have we reduced our water usage. The Committee have also gone around to the classes informing the students that our school is aiming to receive the third Green Flag on water. They have put up posters in all classes informing the students of what they could do to conserve water. Also we put signs up in all of the toilets reminding students to report leaks, pull up taps and hold the lever on the toilet down for 5 seconds to save 3 litres of water per flush. The Committee also made a PowerPoint on the way to flush the toilet to say 3 litres per flush. This was shown on the TV screen in the Assembly. 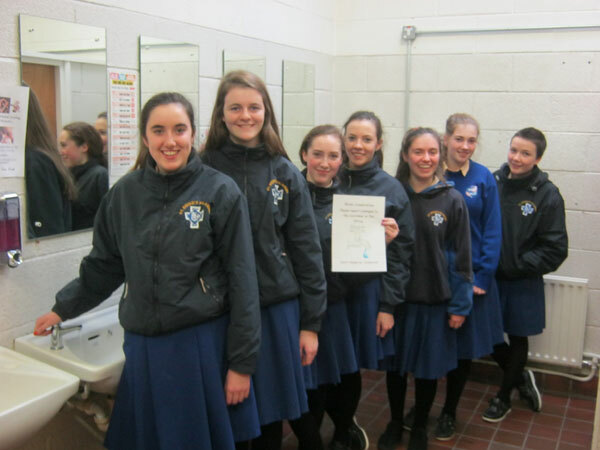 From analysing the bills, St. Brigid’s is saving a lot of money from the water conservation measures that have been reduced. We also display our facts and figures on water on the Green School notice board. 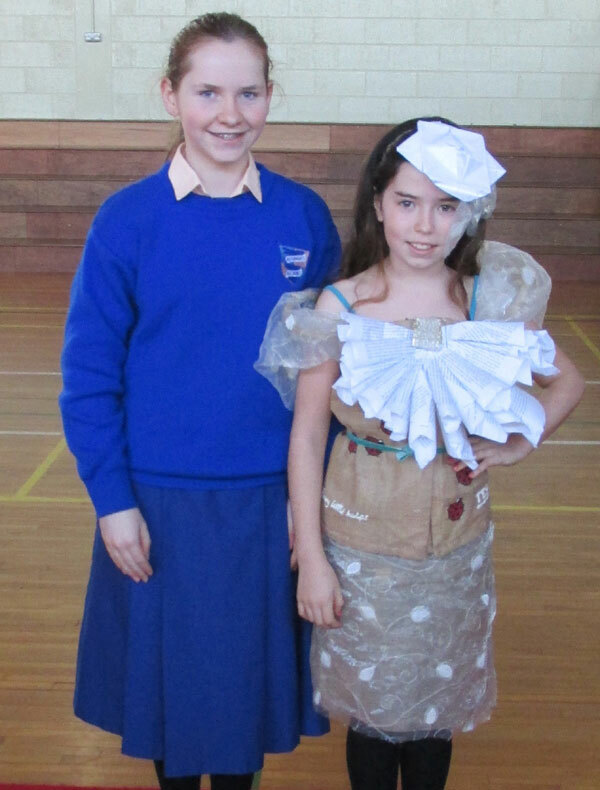 In order to promote awareness of recycling in our school, the Green School Committee organised a Green School Couture Fashion Show on the 20th November 2014 to promote our Recycling theme. The first year students designed and created magnificent attire made from all recycling materials. This event not only highlighted the importance of recycling but it also exposed the creative side of the student. Prizes were presented by Elizabeth Lyne,owner of Lynes Clothing Main Street, Killarney. This event was also partially funded by Kevin Cotter Catering. Below is a photo from the day and more photos may be found under 2014/15 events in our gallery section. 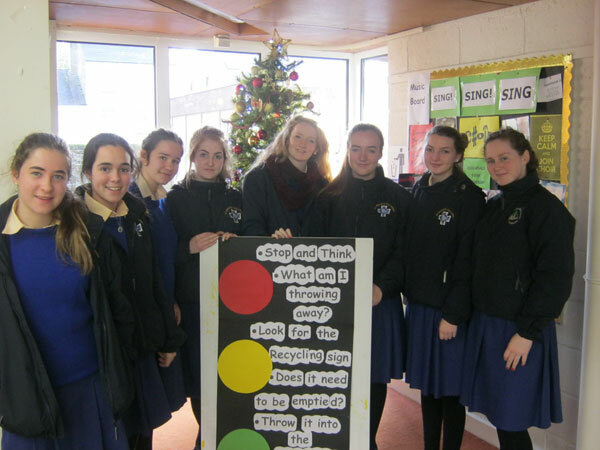 From the 17th -21st of November 2014 the Recycling Committee organised a Recycling Week to remind students of the importance of recycling. This week included an array of lunch time activities including: ‘Recycling Basketball’, ‘Guess the bottle Caps’, ‘Recycling Goods Demonstrations’, ‘Recycling Art competition’ and ‘Scavenger Hunt’. Prizes were presented at the end of the week to the winners. From the 8th to the 11th of December 2014 the Green School Committee organised an Energy Awareness Week in which activities were held every lunch time to promote energy efficiency measures in our school. Activities included, 'Guessing Competition', 'Whats the Watt' an art competition and a poetry competition. From the 23rd to 27th of February we will hold a Water Awareness week to make the students aware that we are striving to get our third flag, Water Conservation.